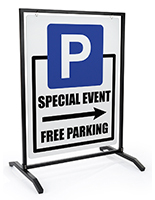 In the world of outdoor marketing, one of the most common forms of advertising is placing a highly visible display out in front of your business. 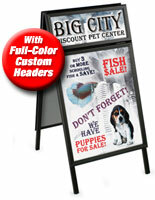 With a custom printed sidewalk sign, you have the ability to personalize your store while enticing potential customers. 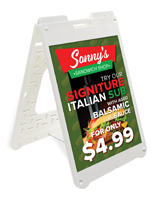 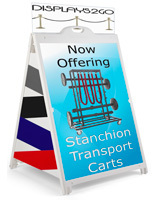 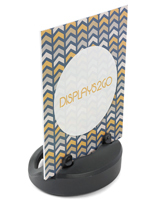 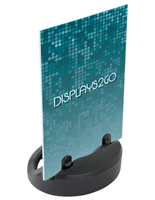 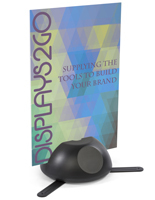 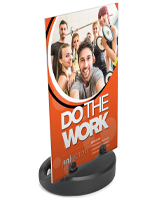 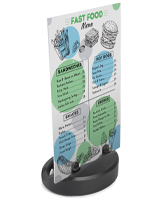 These exterior-rated A-frames and sandwich boards offer convenient portability. 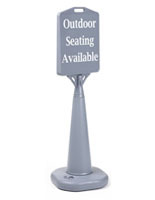 Since they need to be constantly transported indoors and out, this is an important feature. 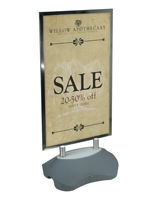 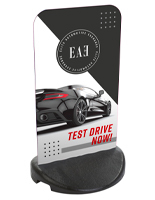 Most of these outdoor displays usually showcase paper posters that can be affected by moisture infiltration. 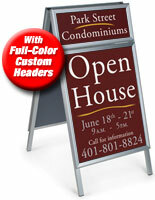 On the other hand, our custom printed sidewalk signs come with weatherproof graphics, unaffected by the elements. 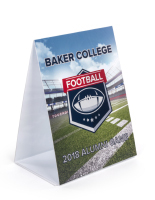 Whether applied to rigid Coroplast® panels or directly onto the frame itself, the graphics can get inundated with rain without any adverse effects. 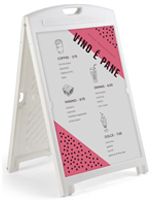 What are my options when choosing an exterior sandwich board or A-frame? 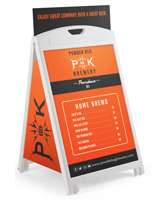 Our custom-printed sidewalk signs feature two types of print processes. 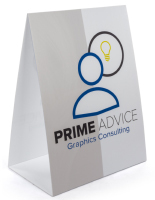 Computer-cut vinyl graphics are the economy choice. 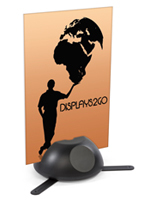 Intended for simple designs or text, this service is available as a one-color option only. 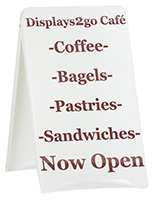 If you need your signage application to be simple, direct, and easily legible, vinyl graphics are the way to go. 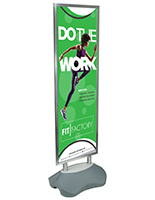 Conversely, ultraviolet (or UV printing) offers full color imaging. 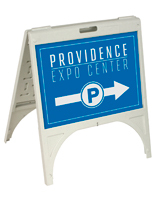 The print process applies the ink to the sign panels on a large flatbed that resembles a big traditional ink-jet printer. 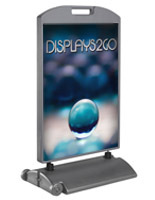 As soon as the ink hits the signboard surface, a bank of bright ultraviolet lights cures the ink instantly. 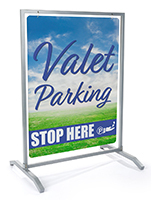 While more expensive than computer-cut sign vinyl, UV printing offers unlimited graphical possibilities. 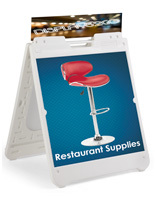 We can print colorful photos, fine details, and even match corporate PMS colors. 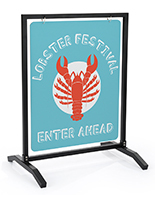 The double-sided frames that come with your custom printed signs fall into two categories. 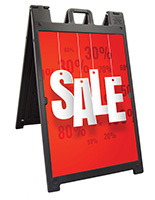 For locations where wind isn't a factor, we stock traditional A-frames that fold flat when not in use. 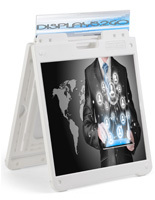 These models are lightweight and some even come with integrated carrying handles. 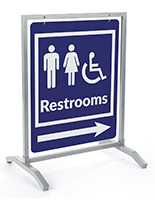 For gusty locations, a sidewalk display with a fillable base or frame is required. As a store owner, you don't want to be going outside every 10 minutes to right a fallen sign. 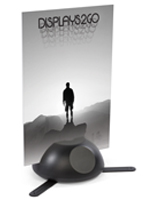 These models feature hollow construction that accepts either water or sand. 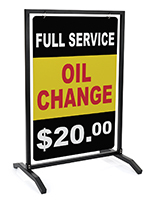 The added ballast keeps the signs upright even in the most windy conditions. 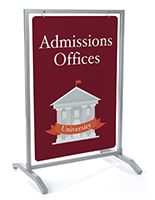 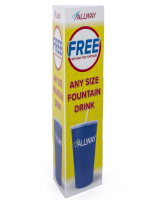 One of the advantages of purchasing graphics with the sign frames is added convenience. 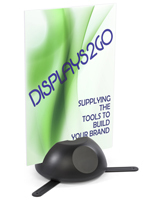 Normally, a customer would buy the display from us then have to visit a local print shop for the poster. 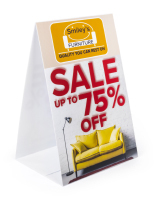 With our in-house printing service, both pieces of the puzzle can be fulfilled with one-stop shopping. 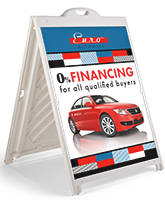 Take advantage of free advertising real estate right outside your establishment! 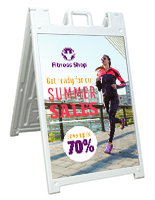 Whether you operate a restaurant, pub, or gift shop, an outdoor sidewalk sign gives passersby a reason to step inside your door!